The MMA7361 from Freescale is a very nice sensor with easy analog interface. The MMA7361 is a 3.3V part and outputs an analog voltage for each of the three outputs. This voltage is in ratio to the measured acceleration and to the supply voltage (ratiometric). It has selectable sensitivity by dip switch. You will need some extra hardware to convert this analog signal to a usable digital one. The Arduino is really good option for it. This break board is especially designed for Arduino which has 3 JST connector that can be easily plug into our IO/Sensor expansion board. And we have collected some useful 3-axis data processing methods: How to Use a Three-Axis Accelerometer for Tilt Sensing. 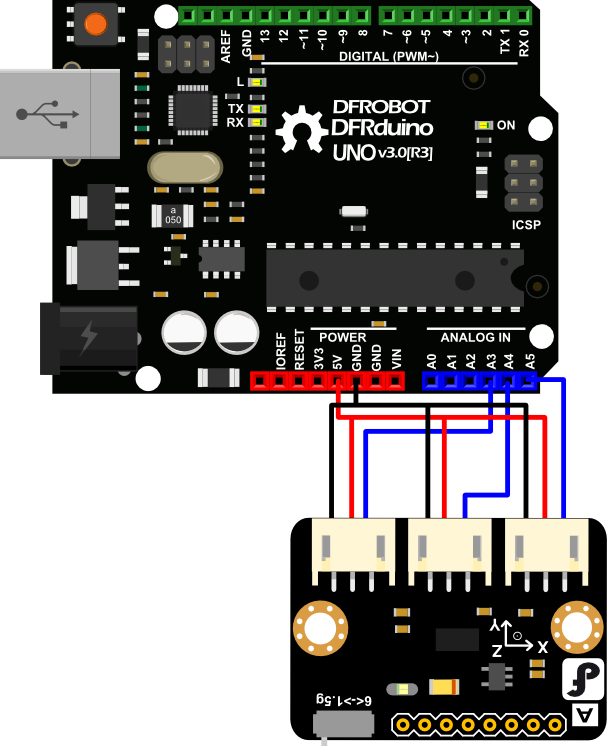 Get Triple Axis Accelerometer MMA7361_DFR0143 from DFRobot Store or DFRobot Distributor.